This is one of the most unique forts in India. It was built by the Portuguese almost 600 years back. It is situated on an island, in the town of Korlai. 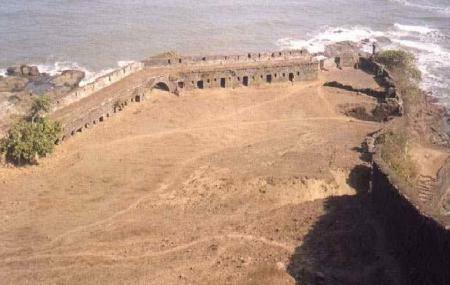 Although now the fort itself is mostly in ruins, the view of the beach and sea is breath-taking from up here. The climb to the fort is steep. Those are adventurous will love this trek that leads to the fort. The place is not very crowdedand is therefore a perfect destination for those who are seeking calm and peace. The climb is very steep. Carry your own water bottles and snacks. Avoid visiting in the monsoon. Rs.50 to reach the top of the lighthouse. How popular is Korlai Fort? People normally club together Kanakeshwar Forest and Nagaon Beach while planning their visit to Korlai Fort. Absolutely stunning view from top. They drive to the lighthouse is rather scary but worth it! There were no people at all when I went there at midday. Looks small but the fort stretches from one end of the hill to the other. The view from top is magnificent! Nice and peaceful seashore with less crowd. Prefer morning or early evening time for visit, because otherwise place doesn't feel safe. 1. Built by Portuguese 2. Best time to visit is rainy season 3. No drinking water or food is available near to fort and also on the fort So better go with enough drinking water 4 . Amazing view from top .I just loved it . 5 .there is church as well as Hindu temple . Beautiful fort as it is situated in place From where a nice view of sea is seen. The road that leads here is underconstruction so be careful while you take any 4 wheelers. We didn't know and had to reverse in a narrow lane so it was so difficult. You have to leave your vehicle down and walk. Its basically a obsrvatory and fort is almost lost its beauty and structures also. Still you can visit to get some good view and good photos here. But you need to drive through tiny lanes and a bad smell of dried fish spread on the road to this fort. Else a good spot for explorers.